 If the Taste Buds were an ice cream sundae, Fritz would be the cherry on top! 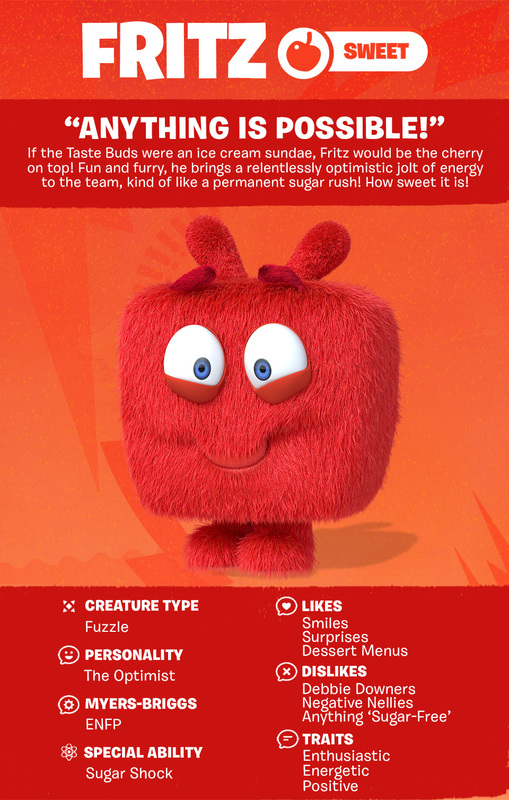 Fun and furry, he brings a relentlessly optimistic jolt of energy to the team, kind of like a permanent sugar rush! How sweet it is!  Everything about Frank is BIG – his personality, his laugh, and his love of salty snacks. 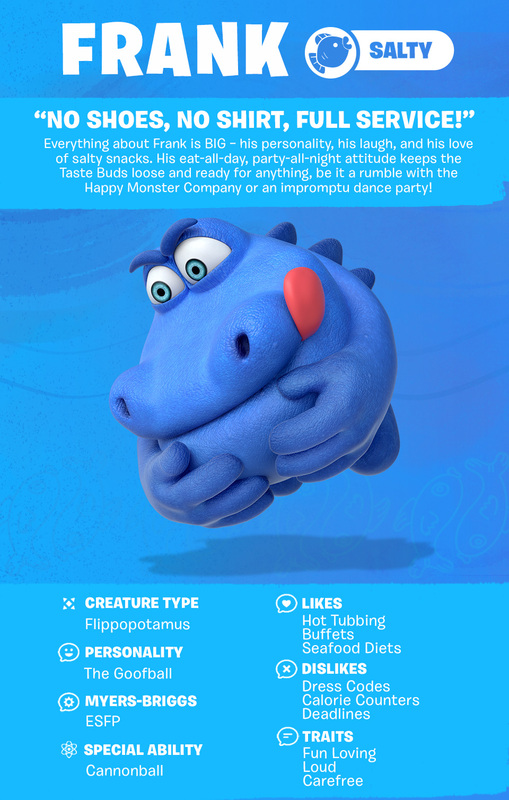 His eat-all-day, party-all-night attitude keeps the Taste Buds loose and ready for anything, be it a rumble with the Happy Monster Company or an impromptu dance party! 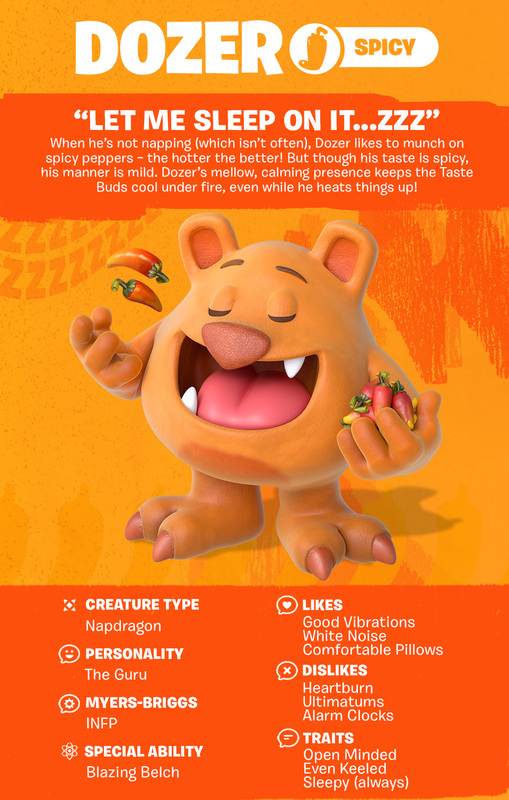 When he’s not napping (which isn’t often), Dozer likes to munch on spicy peppers – the hotter the better! But though his taste is spicy, his manner is mild.  Dozer’s mellow, calming presence keeps the Taste Buds cool under fire, even while he heats things up!  Rudy is the merry prankster of the group.  When he’s not sipping something sour (say, pickle juice with a twist of lime), this master of mischief torments Orson and the Thingamaguys using his hidden wings and other tangy tricks! Pucker up! 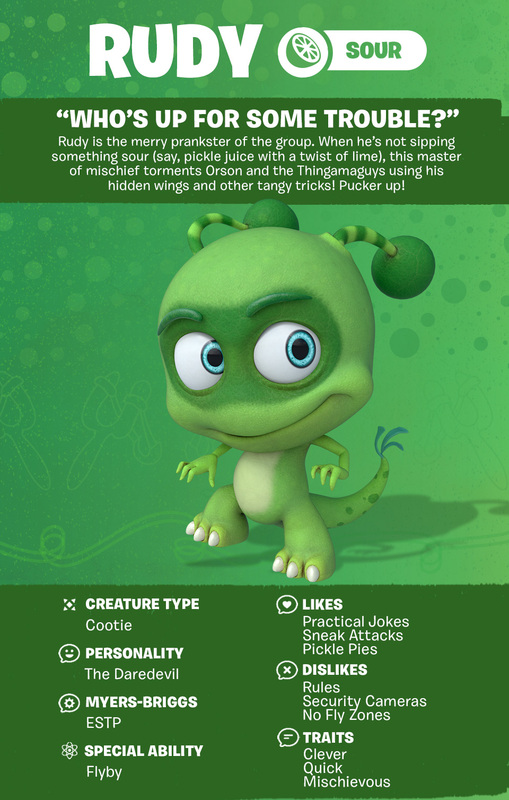 Bitter foods are an acquired taste, and so is Grrreg. 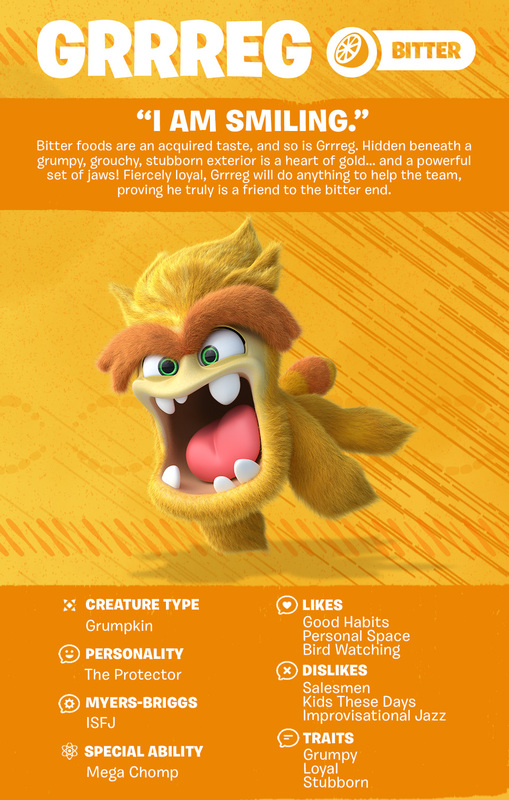 Hidden beneath a grumpy, grouchy, stubborn exterior is a heart of gold… and a powerful set of jaws!  Fiercely loyal, Grrreg will do anything to help the team, proving he truly is a friend to the bitter end.  Smart and determined, Brecky leads the Taste Buds as they defend the food, fun, and friendships of Flavoria. 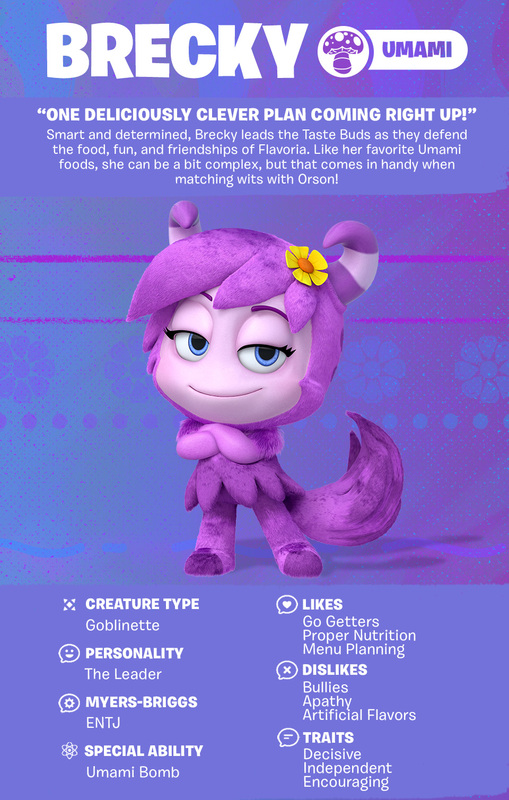 Like her favorite Umami foods, she can be a bit complex, but that comes in handy when matching wits with Orson!  Born without taste buds, Orson has never known the joys of good food. After years of feeling left out, he decided to do something about it. Ever since, using the cover of the “Happy Monster Company,” he has unleashed his devious inventions to eliminate all flavor from the world! BEHIND EVERY GOOD SUPER VILLAIN IS A BAND OF CAPABLE HENCHMEN. 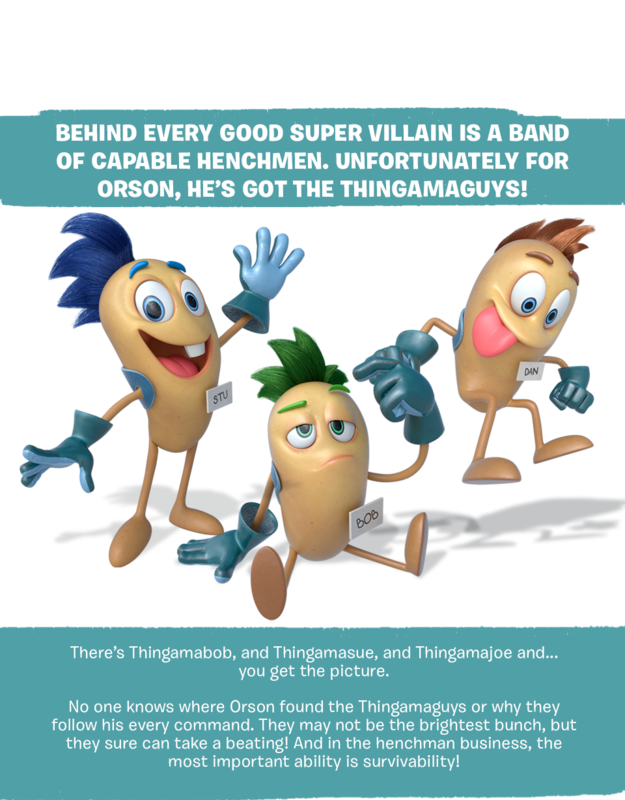 UNFORTUNATELY FOR ORSON, HE’S GOT THE THINGAMAGUYS! There’s Thingamabob, and Thingamasue, and Thingamajoe and... you get the picture. No one knows where Orson found the Thingamaguys or why they follow his every command. They may not be the brightest bunch, but they sure can take a beating! 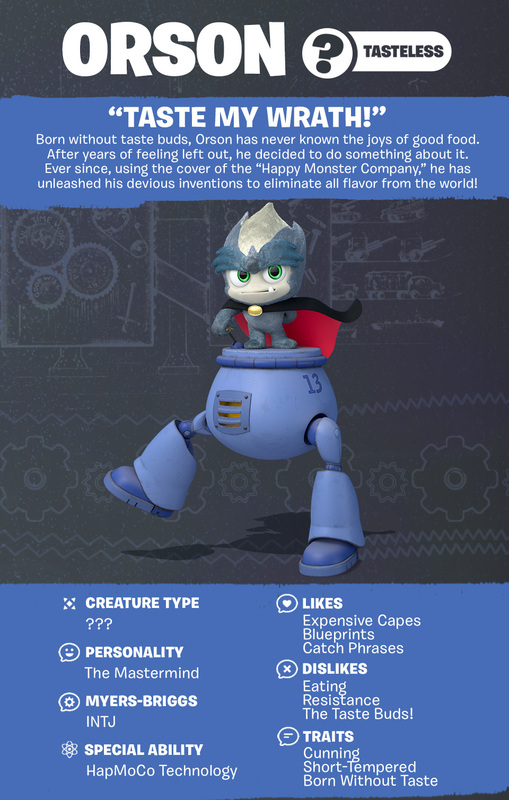 And in the henchman business, the most important ability is survivability!